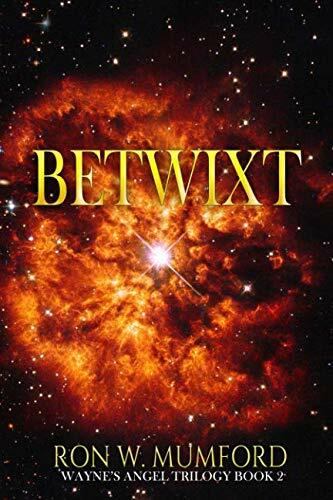 about this book: Betwixt, Christian fiction, book two of the Wayne's Angel trilogy centers around two characters, Bella, the very worldly "sister" of Abby Hawkins, and Dr. Helle Guyion, the most evil woman on the planet. Bella tries to hook up with NASA Para-psychologist, Dr. Eric Palmer who works with NASA to talk to astronauts about un-explainable things in space. When the experiences of the characters in book one comes to light, Dr. Palmer enlist the help of former college flame, Dr. Helle Guyion who does the same job with Russia and Chinese cosmonauts. Together the two psychologists try and unravel the supernatural experiences of Wayne Tyler and his friends. Dr. Guyion comes to America with many supernatural powers. She controls all the drugs coming into Europe and Asia and has slept with most of the Communist heads of state, both male and female. When Ishtar, Satan's concubine is cast into the pit in book one, he decides to replace her with Bella and casts a spell on Bella in a dream to come to Mount Siphon. Bella is in over her head, scared to death. Daddy Hank, who has just met the love of his life, is sent by Wayne's Angel, Gordon, to fight for Bella in very unusual combat. Dr. Guyion defies the F.B.I., NSA and every U.S. government agency with her powers and puts the world on alert for WW III. Pandora's Box literally comes into play. The ending chapter is entitled, "I'm pregnant, I'm Pregnant, Me Too." The last book of the trilogy is entitled, "Z-Gen, the last generation." These books are "out there!" Be ready!! !